Not too long in the past microwaves simply didn’t exist but not they are almost considered an essential in every kitchen. 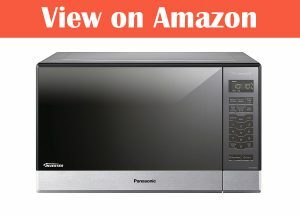 Finding a quality microwave along with being available at a reasonable price point can sometimes be difficult and finding the right balance of price and quality is a balance that Panasonic has tried to perfect with this microwave, but have they done a good job of it? Below I will cover everything you need to know about this microwave! The first thing I really like with this microwave is the design. It is an elegant design with a stainless-steel finish that should fit into almost any style of kitchen thanks to its contemporary style and overall look. The controls have a great design and are touch button operated. The display uses blue LEDs which are easy to read even from the other side of the kitchen. The 2nd thing I immediately want to point out with this microwave is its small footprint. It doesn’t use up as much space as a microwave you may have used in the past and also has more interior space as well. So basically, you get best of both worlds in one – a microwave that is compact and has plenty of space inside. As far as general functionality goes this microwave is excellent – setting the time you want to cook for is simple and intuitive. It has all the features you would expect from a microwave such as having a defrost option and being able to quickly cook by adding 1-minute increments etc. Though one of the more unique features of this Panasonic microwave is what they call Inverter technology which basically is meant to distribute a consistent stream of power no matter the temperature chosen. What this means when cooking is food that is cooked through properly and without burnt edges etc. You really must use it to see it properly for yourself, but I can say when compared with other microwaves it does seem to cook more thoroughly without burning food etc. This technology is particularly impressive when you use it with the sensor reheat option. With this option all you do is place food you want to be reheated inside, then you press the sensor reheat button. You don’t set a time to run or a temperature – the built-in sensors in the microwave will do that automatically and it works flawlessly. Food is always perfectly, it’s never under or overcooked – really this feature is one of the best features of this microwave and should be a big selling point for a lot of people. Another note on the operation of this microwave is that is when you are using it at max power it will cook the food surprisingly fast. You will especially notice this if you are coming from lower wattage microwave before. With this microwave you have 1200W of power which is excellent especially if you are looking for faster cooking times. A final thing I would like to mention is that this microwave is quiet. I have used a plethora of different microwaves and this is one of the quietest that I have used. This Panasonic microwave comes with all the core features you would expect from a microwave along with some more interesting features that are both useful and practical to use daily. Not only do you get all the functionality you need but you also great a microwave that is well built and has a sleek design with a small footprint. This microwave is an excellent choice and I highly recommend it.